Manikarnika: Kangana Ranaut Becomes 'Meme Ki Rani' For Her Fierce Expressions! The teaser for Kangana Ranaut's new movie, Manikarnika released on October 2 and the memes have already begun on social media platforms. And they're hilarious AF! 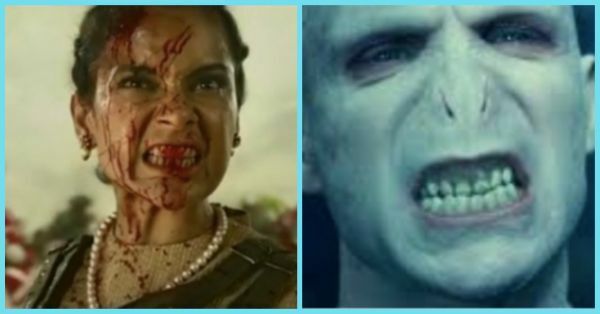 People have been comparing Kangana's enraged, bloodied look to Voldemort, an angry cat and even a bleeding Shah Rukh Khan. No, it just doesn't stop there, so take a look at all the hilarious Manikarnika memes that made us laugh today. The movie is set to release on 25 January 2019 and stars Kangana Ranaut as Rani Laxmibai. Amitabh Bachchan is narrating the story while the Queen of Jhansi fights the English. It's a powerful story, with an equally strong narration. Kangana is fierce in the trailer and we can't wait to see her as Jhansi Ki Rani.